This week, America’s long-running and virtually unchanged gameshow Jeopardy! is featuring “Power Players,” which on Monday and Tuesday meant famous people in the arenas of news, politics, and books. As a celebrity, it might be tempting to let America see you in a new environment being both goofy and well-read, while raising money for a charity at the same time. But that probably isn’t going to happen, because, by no fault of your own, most people don’t have enough trivia knowledge to be impressive. Best case, you make it out of there with your dignity intact and a big check; worst case, you make us feel deeply humiliated to even be watching. Monday evening’s episode featured Chuck Todd, S.E. Cupp, and Jonathan Franzen. This show went as well as could be expected—everyone knew how to play, everyone did well, everyone cracked a few, but not too many jokes. Cupp won $50,000 for a worthy charity; we all had a good time; boom, we go to sleep feeling great. Tuesday’s show did not go as well. The contestants, Anderson Cooper, 60 Minutes’ Lara Logan, and former RNC chairman Michael Steele—all highly respected (depending on where you stand politically) media figures who have earned their stature through years of real work. They had nothing to prove; they did not have to do this. Why did they do this? What did we gain? For one, the three contestants did not do well just from a pure trivia perspective. But each contestant was also clearly waging a war with him or herself, on stage, in front of America and king Alex Trebek himself. Steele was silent for the entire first segment and only chimed in to say the Roman name for Aphrodite (Venus), answered three more first-round questions and then stayed silent for the rest of the game. Cooper, who is likely able to master large tranches of background material to be able to competently handle presidential debate moderation, did not seem to retain much of that information for Tuesday evening’s broadcast. Multiple times, he answered politics-related questions with the confidence of one of the most famous news anchors in the country, only to be dead-wrong (and significantly off the mark, too). When this happened, he would shout, “Ohhhh!” like it was on the tip of his tongue. Was it? Who can say? 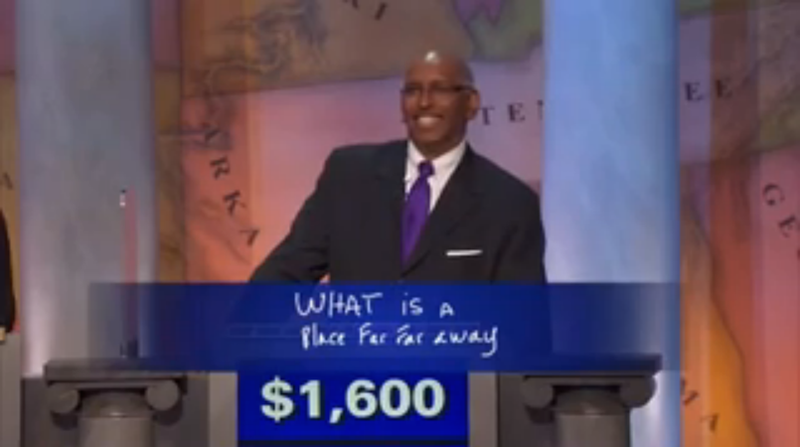 The thing with celebrity Jeopardy! is that everyone has an ego the size of the moon. Getting questions wrong bruises that ego. So, when Trebek tries to say the answer (many of which were extremely easy, like what the line “Wilson!” is from [Cast Away]) and whose HeLa cells became medically important [Henrietta Lacks]), everyone has to pretend like they knew it all along, which, honestly, they should’ve. But also, be quiet. And then Final Jeopardy. Oh, mama mia, was it a disaster. What can I say? Be more confident about your Pakistan knowledge, Anderson! Lara, girl, you fine. But Michael, oh my God, Michael, can you not name a single South Asian country? The point is, all of the contestants could conceivably have donated $50,000 (the winning prize) to their charities without this kind of brand wrecking. Where do we stand now? Celebrities, think twice next time, and then probably just say no.